Kim thought she was just coming to Meridian Hill Park to get some nice springtime family photos. Little did she know, Jhi and his son Justin had a surprise planned for her - Jhi was going to propose halfway through the session! Of course, I was in on the secret too, in order to capture the big event. This is seriously the BEST way to have a photographer document your proposal! I didn't have to worry about hiding in bushes or being spotted at the wrong time - I could be out in the open with my camera and Kim was none the wiser. Jhi wanted to capture some nice family pictures of the "before," and then we came up with a signal to indicate that it was go time for the big moment. But I know it must have been killing him to wait through these first few pictures! I feel like Justin has an adorable "I've got a secret" smirk going on in some of these shots! Meridian Hill Park is so pretty - I love all the giant staircases, and this fountain turns on once it gets warmer out! 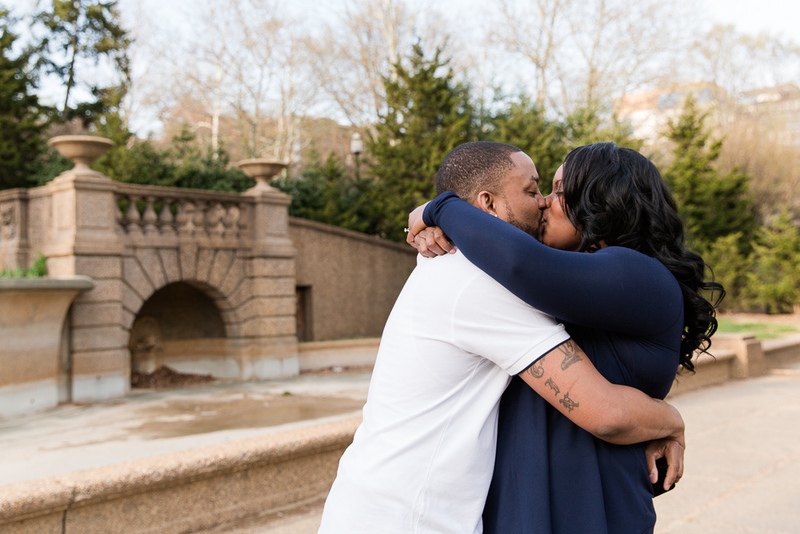 Jhi picked such an iconic DC venue for his proposal. Last pose before they become fiancées! I told Kim to stand with her back to Jhi for this pose, and that he would walk up from behind and give her a hug. So instead of walking to her, he grabbed the ring box and went down on one knee. And you know whenever someone uses your middle name, something important is going to follow! Oh she whipped her head around so fast when she heard that middle name! Gotta show off that new ring! I swear Kim's smile is bigger in all these engaged photos than it was earlier. I think she's pretty happy! I loved getting to be a part of this special day - thanks for having me Jhi and Kim!